Add milk, sugar, fresh yeast, oil, yogurt, egg, and salt to a heatproof bowl and heat in the microwave for approx. 2 min., or until lukewarm. Add flour to the mixture and knead into a smooth dough. Cover and set aside to rise for approx. 1 hr. On a flour-dusted working surface, divide dough into equal-sized pieces. Using a rolling pin, roll each piece out into a 0.5 cm/0.25 in. round. 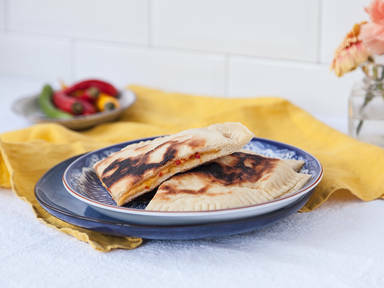 Chop chili and distribute on top of half of the dough circles, along with cheese, leaving an edge of approx. 2-cm/0.75-inch. around the perimeter. Top cheese-covered dough with empty dough rounds and seal the edges. Heat an oil-free pan over medium-high heat and fry the naan for approx. 2 min. on each side. Add oil and fry for approx. 30 sec. on each side to make it crispy. Remove from pan and season with salt. Enjoy!